Welcome to my world of passion! Filling Your world and Mine with splashes of colour, to inspire, engage, and encourage you to nurture the creative soul within you. My art begins by drawing a circle with a traditional compass and straight edge. The circle is divided into lines; then layers and layers of lines are built upon each other, connecting and creating a myriad of crossroads. More circles are added at these cross points creating many paths to choose from which gives birth to the final pattern. I then bring my geometric composition to life and shape by experimenting with colour and choosing the shapes and elements from the visual layers. 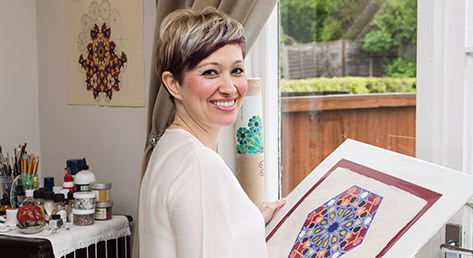 The patterns I draw come from traditional Islamic geometric compositions found within Islamic art and architecture worldwide. These patterns engender the language of symmetry, repetition, infinite weave and movement that one sees in the natural world. Geometric forms have been used by all cultures, traditions and civilizations as they represent the universal language of mathematics. The fundamental link between proportion and beauty. Inspiration comes to me through these fundamental principles and I would like to encourage you to stand still, observe, absorb and contemplate the harmonious beauty in the universe. A flower opens, a pattern born’.